ĐÀ NẴNG — The Government has created the best conditions to help labourers enjoy favourable housing, health care, insurance, legal assistance and living standards in industrial zones (IZs) and export processing zones (EPZs). 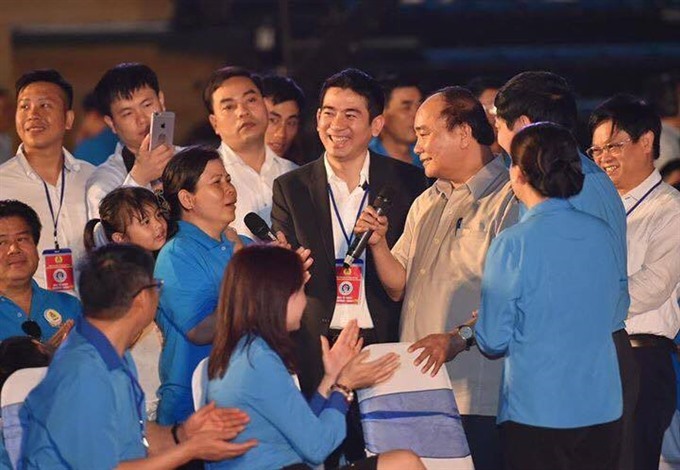 Prime Minister Nguyễn Xuân Phúc made the statement during a dialogue with labourers in the central region at Đà Nẵng’s Tiên Sơn Sports Centre on Saturday. The dialogue, organised by the Việt Nam General Confederation of Labour (VGCL), was attended by more than 2,000 labourers working at IZs and EPZs in Đà Nẵng, Quảng Nam, Thừa Thiên-Huế, Quảng Trị and Quảng Ngãi. Phúc said it was the second time he has directly talked with labourers on how to improve production and living conditions for workers at IZs and EPZs in the central region. “I was extremely impressed with talks from thousands of workers in the southern region last year. I want to hear them talking about living and working conditions at working places as well as problems and difficulties that they faced,” Phúc said. “The Government has reserved VNĐ197 billion (US$8.7 million) for developing houses and apartment projects for workers at IZs and EPZs nationwide,” he said. Phúc said that various measures have been built by the Government to support workers including libraries, kindergartens for workers’ children, entertainment centres, nutritional meals and special conditions for female workers during pregnancy and nursing. The PM also asked local governments and trade unions to strengthen inspections on food safety, insurance, health care and training among businesses. He said the revised Law of Labour includes fines of VNĐ3 billion (US$133,000) or seven years imprisonment to on employers who don’t buy insurance for employees. During a two-hour talk, workers asked the government to help improve income, sustainable development, skill development and housing. Phan Thị Tuyết Sương, a worker of the Đà Nẵng Foster Electric comnpany, told the PM that she has yet to have her own house despite having worked hard for the last 20 years. "I am staying with my two daughters in a shed on some vacant land in the commune. I hope the Prime Minister can help me to earn more money to buy a house and take care of my family better," she said. On Saturday, the VGCL inked agreements with eight businesses in providing commodities and service with preferential prices for labourers in the region. Also to celebrate the upcoming International Labour Day (May 1), the VGCL began construction of a housing project with total investment of VNĐ377 billion ($16.7 million) in the Điện Nam-Điện Ngọc Industrial Zone in the central Quảng Nam Province. According to the confederation, 1.2 million workers out of a total 2.7 million at IZs and EPZs need housing services nationwide. The Mekong Delta province of Sóc Trăng should expand cultivation of high-yield rice varieties and fruit trees which grow well there, said PM Phúc during his visit to the province on Saturday. For example, he said, each hectare of green-skin grapefruit and King orange in Sóc Trăng can generate an economic value 10 times higher than one hectare of rice. Large-scale cattle farming is also a strength of Sóc Trăng, with global demand beef huge, he said, naming another measure to reduce the poverty that is still high among ethnic minorities. He asked the province to strive to become a shrimp production hub of the Mekong Delta while paying more attention to industrial development to create more jobs. PM Phúc said as it is one of the three most disadvantaged provinces in the Mekong Delta, Sóc Trăng should pay more heed to encouraging start-ups and improving human resources. The province only has one business for every 565 people, compared to the national average of one for every 140, while infrastructure hasn’t developed well enough, with the province ranking 40th among the 63 provinces and cities in terms of administrative procedures.